Foot reflexology treatment (also known as Thai foot massage) - Eco-Logic Yoga Retreat. 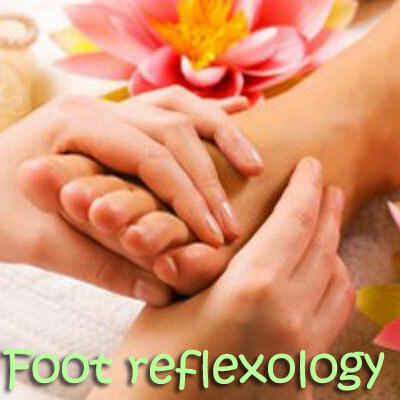 Foot reflexology is the application of appropriate pressure to specific points and areas on the feet. Reflexologists believe that these areas and reflex points correspond to different body organs and systems, and that pressing them has a beneficial effect on the organs and person's general health. For example, reflexology holds that a specific spot in the arch of the foot corresponds to the bladder point. When a reflexology practitioner uses thumbs or fingers to apply appropriate pressure to this area, it affects bladder functioning. Although reflexology is not used to diagnose or cure health disorders, millions of people around the world use it to complement other treatments. Reflexology is growing increasingly popular across Europe and Asia as both a complement to other treatments and as a preventive measure. But most people experience foot reflexology as a very relaxing massage of the foot and lower legs.